Does my child have autism: How to identify the disorder’s early signs. Does My Toddler Have Autism? How to identify the early signs of the developmental disorder. 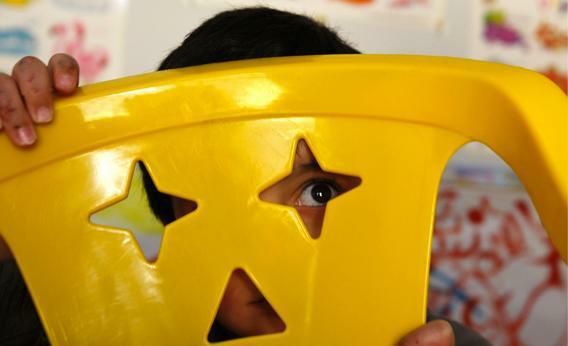 An autistic child looks out from behind a chair at a consulting center for autism. A few columns ago, while attempting to explain why toddlers do crazy things, I mentioned that my 21-month-old son likes to line up his toy cars over and over and over again. A reader highlighted this habit in the comments section and asked whether I’d had my son screened for autism. Her implication, I think, was that I should be concerned—repetitive behaviors can be early signs of the developmental disorder, and autism symptoms usually appear before kids turn 2. Reading her comment, I realized that I had a lot to learn about autism. Sure, we hear about the disorder all the time in the media, but much of what we’re told is either highly controversial or total hogwash, like the idea the U.S. is in the throes of an autism epidemic (we probably aren’t; more on this later) or the notion that vaccines cause autism (they absolutely don’t). Maybe I just don’t read enough, but I have rarely come across information about how I, as a parent, might identify the signs of autism in my child. And this lack of awareness, if it extends to other parents, could be a problem, because research suggests that some autistic children greatly benefit from early behavioral intervention programs that can boost social and language skills, IQs, independence, and adaptability. Autistic children also often exhibit repetitive behaviors and show an unexpected level of interest in inanimate objects, particularly hard ones (pens and keys, not lovies and stuffed animals). This is where my son’s toy cars come into play. “Most toddlers like to do things like bang something over and over or line things up,” Miller explains. But with autistic toddlers, parents may find it difficult to introduce new games or types of play. So if my son wanted to line his toy cars up and do little else, that might have been a sign of a problem. After age 3, autistic children sometimes also display repetitive behaviors called “stereotypies” that can include hand flapping, rocking, and twirling. In bringing attention to autism symptoms, I also don’t mean to imply that autism rates are skyrocketing or that parents should somehow be expecting their kids to develop the disorder. Yes, many media outlets have warned of an ongoing “autism epidemic,” and yes, nearly six times more children were enrolled in federally supported educational programs for autism in 2009–2010 than they were in 1999–2000. But many experts argue that this explosion has more to do with increased awareness, the loosening of diagnostic criteria, and growing educational incentives than, say, environmental pollutants. “A decade or more ago, autism was the last thing you wanted to have a child diagnosed with, because it wouldn’t be covered by insurance, and [the child] wouldn’t receive special treatment in the special education system compared to kids with other disabilities,” explains Alan Rosenblatt, a specialist in neurodevelopmental pediatrics with a clinical appointment at Northwestern University. But “in the last decade or so, advocacy efforts have become very powerful and have made a lot of headway in terms of getting research funding and advocating for making life better for these kids and these families, so it’s now a more desirable group to belong to,” Rosenblatt says. One looming question is how autism diagnoses will change with the recent publication of the revised Diagnostic and Statistical Manual of Mental Disorders (DSM-5), the handbook that U.S. health care providers use to diagnose mental disorders. Compared with the previous version, the DSM-5 has tightened the criteria for autism spectrum disorders to make autism diagnoses more specific and to eliminate false positives, but some research suggests that the changes could end up excluding some people who deserve a diagnosis. One new study suggests that early autism diagnoses could be particularly impacted: The DSM-5 may exclude the forms of autism that tend to be diagnosed at the youngest ages. What’s a concerned parent to do? If your child is showing early signs (you can read more about expected developmental milestones here and even take a questionnaire to see how your child is doing), set up an evaluation with a child psychologist or a developmental pediatrician. Parents of kids under age 3 should also contact a state-funded early intervention program, which can provide a free evaluation and intervention program even before a diagnosis is official; parent of kids over age 3 can learn about available services through their local school district. Intensive, 25-hour-a-week-or-more private early intensive behavioral intervention programs are also available and are usually covered by health insurance. None of these programs ensure recovery, of course—only an estimated 3 to 25 percent of children ever lose their autism diagnoses—but research suggests that they do help a subset of kids significantly. Finally, get information and support from credible organizations like Autism Speaks, the Autism Science Foundation, and the Autism Society. If there’s one thing that the statistics tell us, it’s that families with autistic children are not alone.